A few issues ago I wrote about the mineral potential of the Matanuska-Susitna Borough, and promised to get into more detail later. Now it is later, and because of the importance of the mineral deposits and the potential economic impact the development of those resources could have, I'm starting a series, the first of which follows this introduction. Have you ever wanted a mining claim, but didn't know how to do it, or where to begin? This article will, hopefully, help you along. Before we head into the bush to start staking, there are some rules you need to know, and some points you need to consider. Probably the most important is that you cannot use a mining claim as a substitute for real estate. In other words, don't think that you can just stake a claim somewhere and put up a cabin, or even live in a cabin on a mining claim that has been abandoned. You will be in trespass, and usually you will be in serious trouble for it. The holder of a mining claim does not own the surface, the water, or even the gravel. A mining claim grants the holder with the preferential right to extract the valuable minerals within the claim, and for uses incident to that goal, such as exploration and development. The size of a mining operation is not relevant to ownership of a claim, but a mining operation or exploration towards that goal is the only legitimate use of a mining claim. And because the mining claims confers only limited mineral rights to the holder, anyone can freely cross over the claim, or fish, hike, hunt, pick berries, etc. as long as the activities do not interfere with the mining operation. Likewise, anyone removing minerals from a valid claim may find themselves arrested or sued for theft. Some people have even been shot for these activities. You'll need to know the owner of the land upon which you want to stake a claim. In Alaska, land ownership generally falls into one of these categories: federal, state, Native Corporation, and private (which includes Borough lands). The easiest way to determine land status is through the Alaska Department of Natural Resources (D.N.R. ), either online or at one of their offices in Fairbanks, Anchorage, or Juneau. Land status, i.e. who owns what, what is open to mineral entry (claim staking) and what is closed, and what stipulations and restrictions which may be in place upon those lands, will determine where or if you can stake a claim. For example, some areas are limited to "leasehold location" staking only, which is a type of mining claim, but an important distinction nevertheless. The DNR offices are also where you will obtain the forms necessary to stake and file your claim, and related information, all of which is also available online. The addresses, both physical and online, will be provided later in this article. Status plats are maps produced by the DNR which show the status of the lands in your area of interest. Of the hundreds of millions of acres within Alaska, only about 10 percent is open to mineral entry, about 20 million acres. Much of this is already claimed, but even in popular areas there can be found some open ground (unclaimed lands). There are currently approximately 37,000 state mining claims and 17,000 federal mining claims. The Ultimate Prospectors Toolkit has this information plotted in a GIS system for ease of use. Status plats will help you determine what ground remains open. Another consideration is economics. 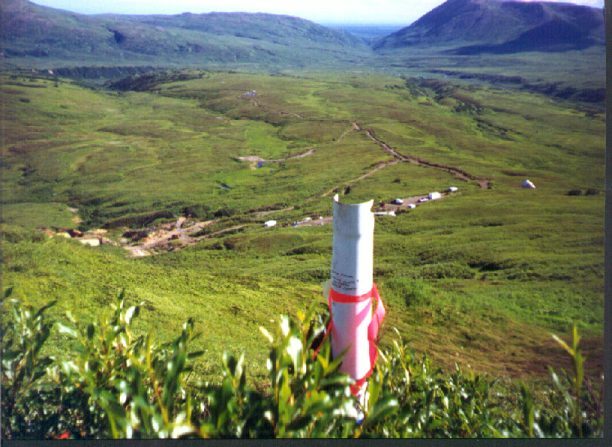 Currently there is a rush on tantalum and platinum prospecting in Alaska, and several projects within a days drive of our area have been discovered in areas not previously recognized or known. A potential diamond deposit near Shulin Lake south of the Petersville Road has been discovered within the last two years and currently is being evaluated. One approach is to look in areas where mining is occurring or has taken place in the past. You can often find areas that were mined a long time ago, and where valuable minerals still remain. Both state and federal mining laws require, as part of staking a claim, that a "discovery" be made. This discovery means that a prudent person would be justified in the expenditure of time and resources upon the claim developing the mineral potential. Rarely will the state bother with the expense and hassle of conducting a validity determination, but the federal government knows no such restrictions. This is probably a good place to point out that you will be much happier staking a claim on state land than you will staking a claim on federal lands. Sometimes it seems (to me and others familiar with the situation) that the federal government doesn't want mining on "their" land. But, if a claim has been mined before, chances are good that some valuable minerals remain. Claims and mines have been abandoned for a variety of reasons. When you decide where you want to stake a claim, and if you can stake a claim where you want one, you'll be ready to begin the process. Mining laws require you to actually go to the area where you want to stake a claim and, beginning in the northeast corner, place a monument. The monument (you'll need one for each corner; however multiple claims owned by the same person or company can share common corner monuments), can be a post of wood or some other material, even a rock cairn, but whatever you use must be at least 3" in diameter and at least 3 feet in height. I use 5' long by 4" diameter white PVC pipes because they are lighter to carry and animals don't rub against them like they do wood posts, and the monuments are very visible. Corner No. 4, ADL 540474I use 5' long pipes so that I can bury 2' in the ground, and still have 3' in height. I paint the ends orange to help the visibility in the winter, but the paint fades in time. I also write all my information, such as my name, the claim name and number, posting date, and so on right on the post in permanent marker. (NOTE: Check your regulations-certain additional stipulations may be required, such as capping the posts). The number one corner is the corner where you'll place your "location notice", which is a copy of the forms you'll be filing with the various government agencies to record your claim. I put mine in plastic bags taped to the monument. You'll need to insure that the monuments are in good shape every year. Formerly the regulations required a claim locator to brush and flag the claim lines between monuments but that requirement has been dropped. The maximum dimensions of a state mining claim may be either 1320' by 1320' (40 acres), or 2640' by 2640' (160 acres), depending upon which type of claim you stake. Recently, the state implemented new regulations allowing the staking of a "MTRSC" claim, which stands for Merdian Township Range Section Claim, and must fit within a quarter section. Otherwise, you'll be staking a claim under the older regulations. Details of the regulations may be obtained from the DNR. Federal mining claims are 660' by 1320', or twenty acres. After you've placed your number one monument at the northeast corner, you then work around in a clockwise direction and post the rest of your monuments. The distance between each monument depends upon the claim you're staking and the presence of preexisting mining claims and other closed lands. The accuracy of your claim staking activity need not be survey-quality, but try to be as accurate as possible. Many people have begun to use GPS devices to locate their corners, which is about as accurate as you need. Greater accuracy is not required. You can stake your claim using only a compass and topographic map. It may be valuable later on to take photos of each monument when you place them, and record the information in a waterproof field book, such as is used by surveyors. I also take soil, rock, and other samples from the hole and any interesting areas adjacent (and within my claim) to the corner, as this provides an easy reference. Next you have 45 days to file your claim documents with the recorders office relevant to your area of interest, and with the DNR. Federal regulations are slightly different, but it is more likely you'll be staking on state lands. The DNR will have information relating to which recording district your claims are located within, but for most of the Borough the recorders office in Palmer is the place you'll be mailing or delivering the forms to, along with the requisite filing fees. You'll note that the forms you get from the DNR have 2 sheets, one for the DNR offices and one for the recorders office, which will leave you one copy short (the copy you need to place on the monument). Therefore, it is a good idea to fill out the forms and make a copy before you head into the hills, and fill in the dates when you finish the task. You'll also need to submit a map of your claim in relation to other claims, section lines, and so on. For this I use copies of the status plats, which helps speed the process and avoids any ambiguity. Filing fees and the first years rental on your claim (you really didn't think any of this would be free, did you?) will vary depending upon what type claim you staked, and on whether it is state or federal land, and how many claims you staked. Average filing fees for claims at the recorders office are $15 each, and the rental, due within 45 days of filing the claim, will be $25 and up. If you're not sure that you want to stake a claim in the area, you can file a Prospecting Site, which is like a mining claim, except that it will expire in two years and can't be renewed. You can stake mining claims or convert the prospecting site to mining claims as it gives you a preferential right if you make a discovery. Once you get the claim, the next challenge is keeping it. Aside from claim jumpers and bureaucrats exercising an abuse of discretion, you have annual rental fees to pay, which begin at $25 per claim and double every five years or whenever the bureaucracy decides to increase them. And you'll file lots of paperwork with various agencies. Probably the most important is the Affidavit of Annual Labor. This document details what work you did on the claim, which is a requirement under both state and federal law to keep the claim. You'll need to do at least $100 in labor per claim per year, but the excess may be carried over for up to four years. Meeting this requirement is easy, just be sure to file the form with the recorders office (along with the filing fee, of course) before the end of November each year. Failure to properly stake or record a claim, or to pay fees and meet annual filing requirements will result in a loss of the claim, known as "abandonment". Once the claim is abandoned you cannot restake it for one year, during which time the ground is open to location by other persons. Staking claims on state-selected land, that is lands upon which the state has placed a selection request but has not received title from the federal government, is risky at best. Because the state has no management authority, no mining operations on state-selected land can be permitted by the state. The best you can do is stake a claim and hope for the best. Mining and exploration operations involving equipment larger than a 4" suction dredge require permits from various state and federal regulatory agencies. The Annual Placer Mining Application, available from the DNR Division of Mining, will satisfy the requirements of most state and federal agencies. In some cases additional permits may be required. Lastly, if you're considering buying a mining claim, you need to be even more diligent. Every year worthless mining claims are sold by people who are unscrupulous or ignorant, and purchased by unsuspecting buyers. Investigate the claim history and status at the DNR, where you can get a factsheet titled "Investigate That Claim Before Buying". You can download this factsheet from the DNR website, and another DNR website, the Alaska Division of Geological and Geophysical Surveys, (D.G.G.S.) has geological, geophysical, and geochemical reports and maps, reports of investigations, pamphlets, factsheets, and more, most available for free download. Note: This article was originally written for the North Valley News in Jan 2002.